ESRI, the world’s leading publisher of GIS software, has created a Story Map that allows users to track the U.S. presidential candidates from the national conventions to Election Day. 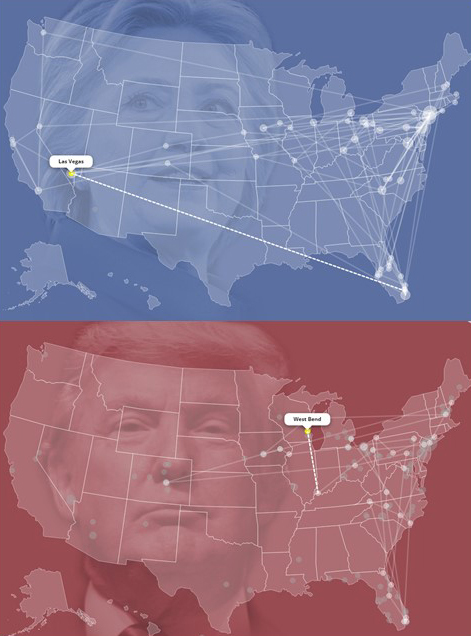 Campaign Travel Log identifies locations where each of the candidates have traveled and provides a glimpse of which swing states will be in play. Users can choose to follow the travel log of Hillary Clinton or switch to Donald Trump. Details of the candidates’ visits are provided in a column on the right. And you can click on a location on the map, and the log will automatically be directed to the description of that visit.